…peers—not inhabitants of entertainment companies or news organizations—can take on the role of curators of content. The economics of the media business has had a settled set of characteristics for a number of years. Companies who succeed at producing and distributing news and entertainment have relied on two ingredients. The first is scale, which means getting a lot of people to read your newspaper, listen to your audio or watch your TV shows. Given the cost structure of the media industries (the high fixed cost of creating content and the low variable cost of distribution), having more customers really ramps up profits since the cost of that extra copy consumed is small. But scale cannot work effectively without a second ingredient—the editorial or curation functions. That is the ability of editors, reporters, entertainment executives and creative people to make compelling media content. In the context of journalism, editors play the role of deciding what news about politics and policy is relevant. In the entertainment world, media executives with an eye for talent and production values are essentially curators making decisions on what music and video people enjoy. That model sustained itself fairly well in an era in which people had a limited set of ways to follow the news or entertain themselves. Three broadcast channels and major markets typically supporting one or two newspapers gave these distribution platforms reasonable opportunities to reach a wide audience. There were also a limited number of distribution platforms at the time with the technological capability to reach a mass audience. News and entertainment companies curated content people would consume and aided them in discovering it. This model has been under pressure for more than a generation. As cable TV emerged in the 1980s and 1990s, many sounded the alarm that standards for news and entertainment—and ultimately political discourse and culture—would decline. But the pressures are greater today because of the pace of change. Distribution networks now connect most corners of the world. Consumers expect them to carry any lawful content that the Worldwide Web contains. Services and devices to access digital content are widely available and, though not universally adopted, have witnessed uptake at rates that are unprecedented. This presents real problems for companies that have been part of the media business for many years. Consumers do not necessarily need them to discover what is worth reading or watching, since digital networks give people a workaround. And peers—not inhabitants of entertainment companies or news organizations—can take on the role of curators of content. But the changes also create exciting possibilities for those who want to participate in society by using media. On a global scale, content creation by the public has grown rapidly. There are now some 1 billion content creators around the world, with most of them amateurs who pursue the activity as a hobby.i The rate of growth in the number of content creators globally is striking—a compound annual growth rate of 23% from 2012 to 2016.ii Many of these content creators are so-called “pro-ams”—that is, professional-amateurs who create content on a regular basis with the hope of attracting a paying audience. One example, as Larry Downes from the Georgetown Center for Business and Public Policy recounted, is the popular YouTube series “Binging with Babish.” The series’ creator, Andrew Rea, has become a YouTube star by showing viewers, in short segments, how to make dishes shown on people’s favorite TV shows and movies. His weekly ten-minute show has 1.8 million subscribers and he has only been doing this since March 2017. The business model for Babish, emulated by many other YouTube stars, generates revenue from a range of sources—patrons who might pay $10 per month, YouTube ads, sponsors and endorsements. The cost side is inexpensive—a digital camera, a business internet subscription, video editing software and the materials to prepare the food. For a single episode, $500 in total cost of production is, for Rea, on the expensive side. Rea is just one example of a “new media elite,” that has changed how Americans interact with media content. These changes are far-reaching and fall very much along generational lines. For Baby Boomers (born between 1946 and 1964), new media sources and new access devices have drawn them away from the tradition of sitting in front of the screen and watching a few broadcast or cable channels. New sources of content have intruded upon their video habits; Amazon Video, Netflix and Hulu have accounted for one-third of Emmy nominations in recent years, underscoring how quality content from those sources are now part of the picture for Baby Boomers and others. Additionally, with “skinny over-the-top (OTT) bundles” proliferating (e.g., Disney announcing that it will pull its content from Netflix and start its own streaming service), traditional multichannel video programming distributors (MVPDs) are losing subscribers. For baby boomers, the result is that the television is less and less the preferred means to watch video. Last year, just 23% say watching video on TV is their preferred way to do it, a steep 50% decline from two years prior. But at least, from the perspective of the established content business, Baby Boomers are watching long-form programming. For Generation X (born between 1965 and 1980), video watching often comes in ten minute spurts, or perhaps “binge watching” programming typically found on YouTube that is a series of episodes whose length is about 10 minutes. Where GenXers may gravitate to the ten-minute video short form, millennials (born after 1980) take it to another level. This age cohort is all about content that is short and self-produced, with little regard as to whether it is done professionally or by an amateur. Content that a millennial might consume might only be one minute in length and on a platform such as Twitch, Vimeo, Simplicity or Instagram. These changes in how people view video has manifested itself in cord-cutting—the phenomenon by which people discontinue their pay-TV subscriptions in favor of OTT services such as Hulu, Netflix or Amazon that rely on a home broadband subscription. New Street Research estimates that pay-TV subscriptions fell by approximately 970,000 in the second quarter of 2017 and that the prior four quarters saw a decline in pay-TV subscriptions of 2.7 million. Overall, according to the Pew Research Center, though 59% of Americans say a cable or satellite subscription is the primary way they watch TV, 28% of U.S. adults say streaming is the main way they view TV. 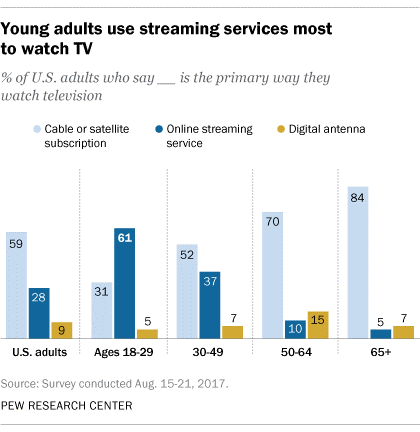 Strikingly, for the 18 to 29 age cohort, 61% say streaming is the main way they watch TV, about twice the figure (31%) for cable or satellite subscriptions. Even though digital technologies have drastically altered consumption patterns and the production of content, the new media market still has frictions. Established content providers often loom large in the new media world, newer platforms perform a curatorial function and the sustainability of the new media business model is open to question. Additionally, it is not clear how well new media meets social goals of expanding the diversity of voices participating in media and facilitating constructive public discourse. Here are some issues and frictions in the new media market that participants identified. Content is king: Scholar Roslyn Layton noted how new media content often works off of large content providers. A prime example is Babish who recreates foods from popular shows, such as his dish based on a “Game of Thrones” episode. Thus, though the production costs of 10-minute episodes such as the ones Babish produces are small, he relies on content that is expensive to produce. Another issue is production value. Participants widely agreed that consumers value content that looks and sounds good. This puts the onus on creators to have the tools to make a video or audio appealing. Those tools may be cheaper than before, but they still have a cost. Distribution platforms still have power—it is just more diffuse than it used to be: Even though “Binging with Babish” turns a profit, it can be difficult for people to discover new content. Ease of entry into the marketplace is not the same as finding consumers. Curation is an answer, which is to say an agent or entity between the content creator and the marketplace, which helps guide users to content that will suit their tastes and be of sufficient quality. Related to discovery is finite leisure time and attention to explore new things. Social media, such as Facebook or Twitter, or even e-commerce sites such as Amazon, can facilitate discovery, but people can devote only so much attention to discovering compelling new media products. Ads on these sites can facilitate discovery, but ad dollars are finite, just as people’s leisure time is. That said, Norman Ornstein of the American Enterprise Institute pointed out that digital devices have a subtle way of expanding people’s leisure time, in that they can consume media on the go with portable devices in ways not possible in the past. The new media business model has uncertainties: The question of whether new media tools add up to a viable business model was the subject of considerable discussion. As Reed Hundt put it, the internet may wind up “turning dollars into dimes” for new entrants to the content market. YouTube, noted Emmis’ Jeff Smulyan, loses $2.5 billion per year, although Johanna Shelton from Google added that Google does help numerous providers monetize content. A YouTube channel needs at least 10,000 subscribers before it can have ads. Proprietors of YouTube channels also have to (or should) deal with issues such as sponsored content (which, if not handled correctly, can run afoul of the Federal Trade Commission), copyright and other issues. Shelton also noted that revenue is not always the goal for content creators. The top five most-watched kinds of YouTube videos are “how to,” which typically are not intended to generate revenue for those who post them. All this raises the real possibility, as Rick Kaplan from the National Association of Broadcasters noted, of consolidation in the new media market in the next five years. This might raise barriers to entry in the media market. Such consolidation may help U.S. companies compete globally, noted guest scholar Eric Karikari, especially as Chinese companies can take advantage of scale to challenge American companies. This sets up a dynamic by which consolidation strengthens the global competitiveness of American companies, but potentially undercuts competition in the U.S. domestic market. At present, however, the balkanized new media market is a challenging money-making proposition for anyone. The result is a new media market where technology has lowered barriers, yet where market dynamics nonetheless introduce significant ones. It may be easy to make 10-minute videos on a topic that may interest a lot of people. But it is not as easy to get noticed, especially in the face of so much other content competing for people’s attention. And it takes resources to produce it in a way that it is compelling to people. Beyond the concern that the new media market may not create much economic value, worries arose about other media values—such as localism and diversity. Jessica Gonzalez of Free Press observed that, when she was growing up, it was rare to see Latinos on TV. Today she can—and often that will happen on online platforms. Yet, as she and Larry Irving from the Mobile Alliance for Global Good noted, it is not necessarily the case that new media solves all challenges connected to encouraging diversity in media; in fact, they said, there is ample evidence that communities of color are not well represented in new media. Localism is another concern, as Brookings Institute’s Nicol Turner-Lee said. Established news organizations are finding it difficult to invest in local content—and it is no sure bet that new media will fully address that. Recognizing this problem, Google News Lab has recently launched, in partnership with several philanthropic organizations, “Report for America” to send young journalists to local newsrooms around the country. There was also the worry about the kind of discourse that social media often fosters. Robert Pepper of Facebook recalled the quote by Les Moonves of CBS who said of the 2016 presidential campaign: “It may not be good for America, but it's damn good for CBS.” The strident nature of campaign debate may not have fostered an especially productive public discourse, but it did sell a lot of ads for television networks. People have incentives to monetize “clickbait,” noted Jeff Smulyan, but often the content of such material is harmful to public debate. i The Boston Consulting Group, “The Future of Television: The Impact of Video Production Around the World.” September 2016. p. 11. .